Awarded OMG! on the AdDuplexHERO program. The interface with Memorize it! is rather simple and straightforward. You have a text field you can enter whatever you need to memorize. Once entered, you have a host of options to choose from to help you memorize the information. These options scramble up the passage to help you memorize things. 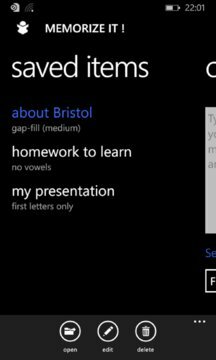 Options include showing only the first letters, removing all the vowels, removing all the consonants, creating gaps in the words and more. When the scrambled passage appears, you practice aloud and if you need a hint, tap and hold the screen to reveal the full text. You also have an audio playback feature where you can read along as the app reads the text aloud. Memorize It! is unusual and effective. The application is conceived simply, yet powerfully. The various schemes are somewhat ingenious. Memorize It!’s star feature is the way in which it offers hints. With the partially hidden or scrambled text on-screen, pressing and holding will fill in the blanks. “Oh yes”, you’ll say, “I remember that bit now!” and then releasing your finger press hides the text again, ready to carry on practising and rehearsing. 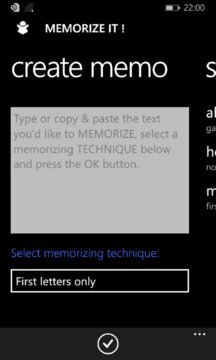 There’s one other feature worth mentioning – tying into Windows Phone’s pretty good text-to-speech engine, there’s the option to read the text out loud. Memorize It! arrives fully featured and comes recommended.